I bought this copy when it came out in 1960, I was a sophomore in high school. The Inner Station is a space station circling Earth in a fairly tight orbit, the stopping place for travelers and goods going to and from Earth and Venus and Mars, both of which have been colonized. Note: the book follows the timeline for colonization which puts it directly after The Sands of Mars (my review of that book is here). After a small battle of words and definitions, during which Roy clarifies that “In 2054, the United States, like all other members of the Atlantic Federation, signed the Tycho Convention, which decided how far into space any planet’s legal rights extended. Under that convention, the Inner Station is part of Earth because it is inside the thousand kilometer limit.” Smart kid, eh? So he gets to go, mostly because World is afraid of a lot of really bad publicity if they change the rules on him (the TV show was very popular). The rest of the book is about his departure, trip to and arrival at the station, described, as we saw in the previous book, in enough detail to make it believable. What’s amazing to me is how accurately Clarke predicts much of what came about a decade or two later, and since then. Roy gets to stay for about three weeks, and even has a chance to take a trip to the Outer Station , which is the arrival terminus for passengers from Mars, who must wait to adjust to the heavier gravity of Earth. On the return trip, a malfunction causes the small shuttle to rocket off into space, beyond Earth’s gravity pull. They will need to be rescued or run out of air in a week. Eventually all turns out okay (I’ll let you read how) and finally Roy returns to Earth after his extended stay in space, most of it in zero gee. Gravity is difficult to handle at first, but he manages. The book ends with his determination to one day become not just a space station worker, but an emigrant to Mars Colony. I liked this one more than Sands of Mars, though both are good, and are now considered classics of the early genre. Both would be considered YA level today, a distinction that wasn’t of much importance when this was written. Both Clarke and Heinlein wrote books that would be enjoyed by younger readers and adults, and they remain very popular, though Clarke less so, which is too bad. This entry was posted in Books & Reading, Friday Forgotten Books. Bookmark the permalink. Another great review, Rick. I enjoyed the review of The Sands of Mars too, and now I want to read both books. You are not helping my desire to stop acquiring books. And I love that you got this copy when it came out. My husband and I both have so many books that we had as teens that we wish we had kept. The Perry Mason series for my husband, and the Rex Stout series for me. Like you, I can sometimes remember when I bought books as a kid. And, like you, I kept the books I bought back in the 1960s (although most reside at SUNY at Buffalo’s Special Collections Library). I love the covers on those early SF paperbacks! Me too, George. 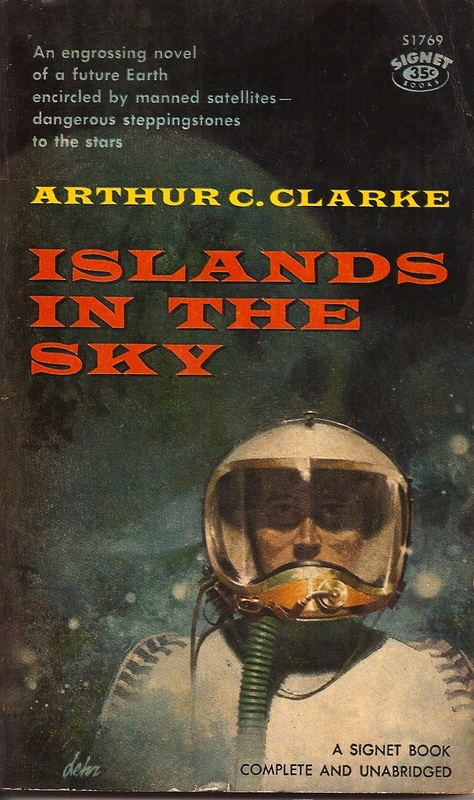 This is another of the early Clarke books I never read because at the time most of you were reading SF, I was reading mysteries (like Tracy’s Perry Mason) and straight fiction. I will look for this one too. Or, at least Tracy’s husband’s Mason collection…Gregory Mcdonald was probably the first CF writer on whose novels I binged, inasmuch as Hearst/Avon had a good jobber at our New Hampshire grocery story, and FLETCH and CONFESS, FLETCH were among the more interesting-looking novels that popped up there when I was a kid tagging along to help carry the groceries to and from the car (a lot of A. Merritt and such oddments as Art Buchwald’s borderline animal fantasy novel, as well). Before he lost most of his memory and the ability to form new memory, Arthur C. Clarke had been my father’s favorite writer, all things considered. Though he never brought home too many of the “juveniles”…I did get to read a copy of Heinlein’s TIME FOR THE STARS when very young, but wasn’t too impressed…liked the likes of “And He Built a Crooked House” and ”All You Zombies–‘” better…as well as the Clarke short story collections around the house, such as THE OTHER SIDE OF THE SKY, THE WIND FROM THE SUN and the retrospective THE NINE BILLION NAMES OF GOD. I am glad to see you are still doing Clarke, who I am rereading and loving even more the second time around. I have not reread this one yet but I will have to keep it in mind.